Leaders are in our lives everywhere you look: They’re our coworkers, members of our family, and even people in our social circles. While some people seem to be born leaders, others must work at it because it didn’t come instantly or naturally to them. Yet the desire and work ethic was always there. Peterborough native Drew Dudley, the Founder & Chief Catalyst of Day One Leadership, Inc., thinks we all have the capacity to show leadership qualities. In fact, he has made an impressive career helping organizations around the world increase their leadership capacity. Now, Peterborough has the opportunity to learn from him too. Drew is coming to Market Hall on Thursday, February 28th to walk participants through a free step-by-step discovery of their own personal leadership values and illustrate how to translate them into daily behaviours that will make a true difference in their lives. It’s a true test of stepping outside of your comfort zone, but once you do the results can be unimaginable. Drew has worked with some absolute heavyweight organizations across the globe, including McDonald’s, Dreamworks Animation, and JP Morgan Chase. In addition, he has held talks at more than 75 colleges and universities across the globe and is zeroing in on Peterborough and its blossoming entrepreneurial scene next. Having spoken in front of over 250,000 people around the world, this is your FREE chance to enjoy an intimate and interactive night with someone who was deemed to have delivered “one of the 15 most inspirational TED talks of all time”. Business Insider, TIME and Inc. magazines have all named his talk as one of their “10 speeches that will make you a better leader”. What are you waiting for? Get registered before seats fill up! Dudley hopes that those in attendance will transform how they make decisions and realize the impact they can have on an individual and organizational success. This unique hometown appearance is thanks to Trent’s Entrepreneurship & Social Innovation Centre (ESIC) in partnership with the RBC Future Launch Program and Peterborough and the Kawarthas Innovation Cluster. 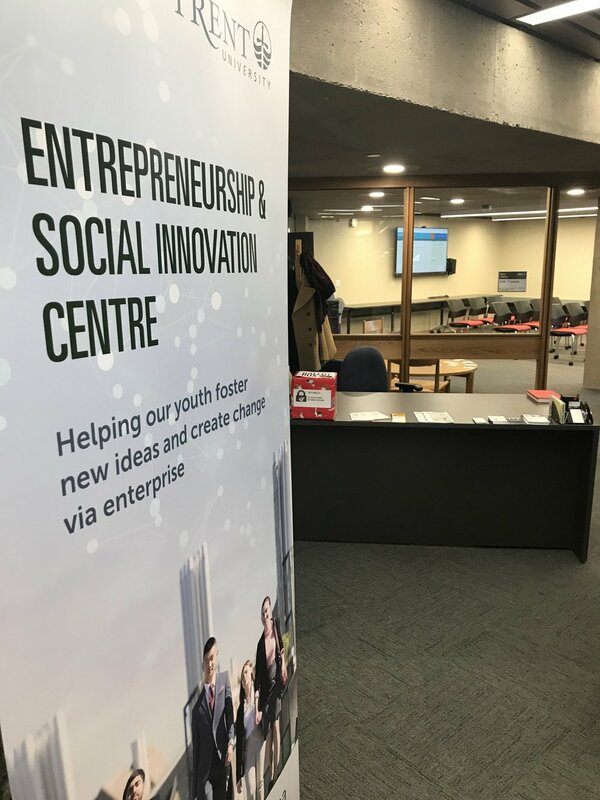 Located inside Bata Library on the beautiful campus of Trent University, ESIC is a game changer for aspiring local youth attending our city’s University. Its goal is to foster the development of everyone involved with the culture of entrepreneurship on campus by providing support for faculty, providing practical and co-curricular learning opportunities for students, as well as allowing access to local mentorship—which is of the utmost importance. As Peterborough continues to become a hotbed of entrepreneurship in a time of shifting career ideologies, places like the ESIC will continue to become a major focal point for growth with events put on to continue the positive momentum. If you’re interested in attending this great event, register here and do it ASAP as capacity is limited and spots are already filling up fast!